Prosecutor investigates reports of Ferguson grand jury misconduct. 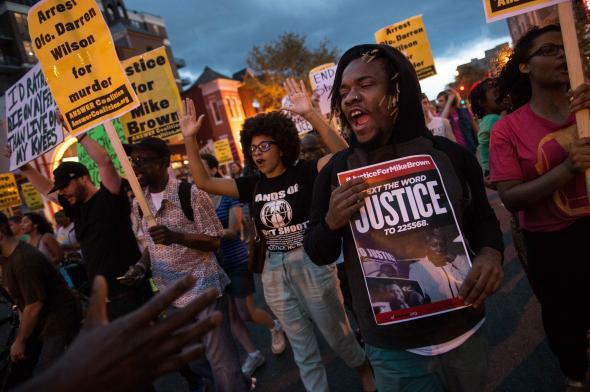 Protesters march in Ferguson, Missouri in September. The tweet has been deleted, as has the user’s entire Twitter account. Ed Magee, spokesman for the St. Louis County prosecutor, told the Post they received information regarding potential misconduct by a member of the grand jury from a “Twitter user” Wednesday morning and were investigating the matter. “Grand jury proceedings are confidential and if there has been a breach, the prosecutor’s office may have to start over with a newly empaneled group,” according to the Post. The grand jury has been weighing evidence in the case since late August and, the Post reports, was wrapping up its deliberations on whether or not Wilson will face charges for Michael Brown’s death.